Wakame is a type of brown algae or seaweed that has been grown by the sea-farmers of Japan since Nara period. It is most popularly served in miso soup. Wakame is considered to be one of the healthiest seaweeds in Japan and is favorite for people looking to increase the health of their skin and hair. In a recent study at Hokkaido University that Wakame helps to burn fatty tissue also. The binomial name of Wakame is Undaria pinnatifida. Earlier in 1603, this seaweed was referred as ‘Vacame’ and then in 1867, the word ‘Wakame’ came into use. In English, it can be termed as ‘sea mustard’. 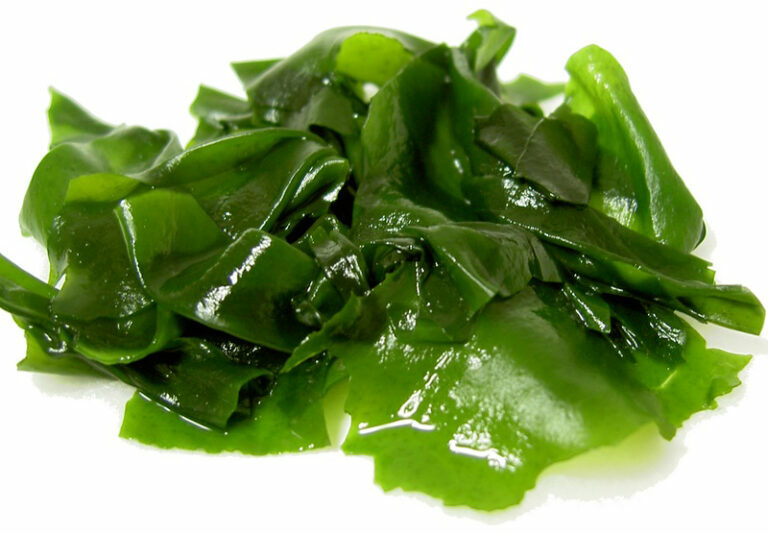 It is an edible seaweed or sea vegetable. Wakame has high amounts of fiber and much nutritional value in it. The subtly sweet flavor makes it perfect for being used in soups and salads. The Invasive species specialist group has listed Undaria pinnatifida on its list of 100 worst globally invasive species. Wakame is thin and stringy and usually deep green in color and is satiny in texture. Wakame can be found either dried or fresh, in a refrigerated and sealed package. This Swanson Brown Seaweed – Wakame Supplement is good for weight loss, fitness. It is herbal supplement made from wakame, which comes under brown seaweed category. Always, buy and use after consulting with the family doctor. If you have never eaten wakame salad or soup, you can try wakame salad or soup at Japanese Restaurant nearby in your city. Wakame has been an important ingredient used in traditional Chinese medicines for a long time. Wakame’s nutritional properties make it incredibly healthy, particularly for vegetarians and vegans, as it is remarkably high in omega -3 fatty acids. It is a very important source of vitamins and minerals including iodine, calcium, iron, and magnesium. It is also rich in folate, vitamin A, vitamin C, vitamin D, vitamin E, vitamin K, and vitamin B2. Wakame also has lignans and fucoxanthin, which have their own unique health benefits. Magnesium: This mineral is critical for the contraction and relaxation of muscles, the function of certain enzymes in the body, production and transport of energy, and the production of protein. Iodine: It is needed for the strong metabolism of cells and needed for the process of converting food into energy. Calcium: wakame easily allows for the absorption of the calcium in the human body which makes bone stronger. Iron: It is essential for the production of red blood cells and prevention of anemia. Folate: helps the body make new cells and is especially important for pregnant women. Lignans: plays an important role in preventing a certain type of cancer, particularly breast cancer. Wakame is most often used in seaweed salad and soup filling. Wakame is often served with a small side salad dressed with rice vinegar and soy sauce. Or it is used in a Japanese marinated cucumber side salad called sunomono. It adds a delicious component to a variety of meals, but recently it has gained popularity because of its health benefits. Wakame is rich in vitamins and minerals, such as folate, vitamin B2, and manganese. Therefore has been used for centuries for its therapeutic and healing properties. Along with these Wakame also has the power to support cardiovascular health, boost energy levels and supply the body with omega-3 fatty acids. It helps to prevent heart disease, cancer, blood clotting and obesity. Wakame has beneficial effects on tumors, oxidation, and inflammation while promoting a good immune system. Long before modern skin care science discovered that seaweed containing marine collagen – plumped and tones the skin, Japanese beauty care for centuries included seaweed for skin care beauty. Wakame is used to make a soothing and detoxifying face pack and body gel-toner. The compound named fucoxanthin which helps burn fatty tissue and used topically to gently cleanse and detoxify your skin. Phytessence Wakame is transformed into a cosmetic extract using new technologies. It is especially good at healing inflamed skin because of its high levels of B-group vitamins, in particular, B1(thiamine), B2(riboflavin), B3(niacin), B6, and B12. It also contains an active ingredient called sulfated poly fucose, which protects cell wall integrity and stability against damaging environmental factors, such as UV light, temperature, and abrasions. In most of the cases, phytessence wakame has demonstrated dose-dependent inhibition of the activity of hyaluronidase in vitro. Hyaluronidase is an enzyme that attacks the skin’s supply of hyaluronic acid, which is responsible for the elasticity and smoothness of the skin. By binding collagen and elastin fibers together, hyaluronic acid makes skin smooth, firm, and flexible. Without hyaluronic acid, elastin and collagen fibers lose their “glue,” leading to a loss of youthful appearance. In inhibiting hyaluronidase, wakame prevents the deterioration of the extracellular matrix, which is a dominant means of defense against visible aging and the weakening of dermal thickness. Hence, phytessence wakame helps to hamper one of the main factors contributing to skin decline with age. is the most popular form of distribution in Japan and America. Raw wakame is washed and dried. It’s convenient and used for soup and salad. (salt curing wakame) is raw wakame being salt cured? It said to have resilient and flavorful characteristics. (ash dried wakame) It’s produced in Naruto, Japan. Harvested wakame is coated with ash and dried. Coating wakame with ash makes wakame brilliant green, and crisper but production has been. Wakame seaweed is common in Japanese cuisine and other Asian cuisines. wakame can be found either dried or fresh, in a refrigerated, and sealed package. When refrigerated, the wakame seaweed is preserved with sea salt and, though it seems wet, it is actually partially dry so that it’s moist to the touch, but not completely dried out and dehydrated and brittle like the nori sheets used in making sushi. Fucoxanthin also stimulates the liver to increase its production of DHA, which lowers the levels of “bad” cholesterol. This is the type of cholesterol commonly associated with atherosclerosis and artery blockage, so you are able to protect yourself from various heart diseases, as well as heart attacks and strokes. The high content of iron in Wakame increases production of red blood cells. Which leads to increased circulation in the cardiovascular system. Wakame help to protect your body from developing cancer. The high levels of calcium found in wakame help your body increase bone growth and speeds up repair.